U.S. President Donald Trump is assailing a new best-selling book about him and his White House as "just another assault against me, in a barrage of assaults." 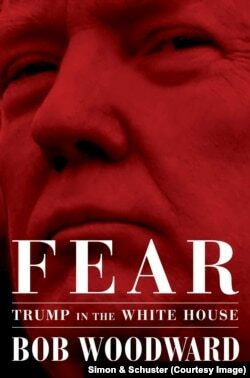 "The Woodward book is a Joke," the U.S. leader said Monday about investigative journalist Bob Woodward's highly critical look at Trump's chaotic 20-month presidency, "Fear: Trump in the White House", that is being published Tuesday. The book has already risen to No. 1 on Amazon's best-seller list, but Trump said the longtime Washington Post reporter and editor used "now disproven unnamed and anonymous sources. Many have already come forward to say the quotes by them, like the book, are fiction. Dems can’t stand losing. I’ll write the real book!" In a related issue, she said Trump continues to have "great concern" about last week's anonymous opinion article by a top administration official published in The New York Times accusing the president of being amoral and being "impetuous, adversarial, petty and ineffective." She said the Justice Department should "look into it," and then decide whether any crimes were committed. She joined other administration officials in calling for the aide to quit, but said no lie detector tests "are being used or talked about" in an effort to identify the writer. 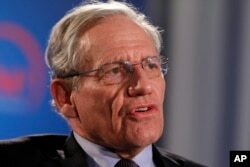 In one of a string of Twitter comments, Trump said, "Bob Woodward is a liar who is like a Dem operative prior to the Midterms," claiming the author "was caught cold, even by NBC" in an interview on the network's Today show about his use of unnamed sources to recreate behind-the-scenes events at the White House since Trump took office in January 2017. Trump retweeted himself from last week, saying, "The Woodward book is a scam. I don’t talk the way I am quoted . If I did I would not have been elected President. These quotes were made up. The author uses every trick in the book to demean and belittle. I wish the people could see the real facts - and our country is doing GREAT!" But he told NBC that until Trump he had "never seen an instance when the president is so detached from the reality of what's going on." "We're doing this to prevent World War III," Woodward quoted Mattis as telling Trump. "The idea that a secretary of defense has to tell the president that all of these actions are designed to prevent the ultimate catastrophe and then Mattis goes on and says, you know, that if we don't keep these programs, which are very sensitive, the only deterrent option we have would be the nuclear option." Asked by NBC why readers should trust his account using anonymous sources, Woodward said, "The incidents are not anonymous. It gives a date, it gives a time, who participates, most often the president himself and what he says." 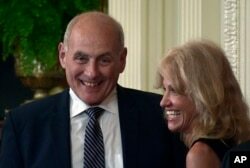 The author quoted White House chief of staff John Kelly as calling Trump an "idiot" and telling a staff meeting in his office, "We're in crazytown," and Mattis as saying that Trump had an understanding of world affairs of something akin to a "fifth or sixth-grader," quotes they both have denied. "They're not telling the truth," Woodward said. He called their denials "political statements to protect their jobs, totally understandable." He described the current and former Trump officials who talked to him as "people of conscience, people of courage who said, 'Look, the world needs to know this.'" Woodward said the officials believe, like former Trump economic adviser Gary Cohn said, "Got to protect the country."